Taking inspiration from Norman Foster's passion for piloting, the works in the "Flight Archive Gallery" explore flight as an activity that goes beyond mere transport. While creating large-scale infrastructural impacts, the selection of architectural projects for this collection attend to the human dimension of experiencing flight. Stansted Airport forever revolutionised the airport typology by creating an unobstructed, light-filled terminal that maintains a consistent relationship between passenger, plane, and landscape. This was achieved by removing bulky service systems from the roof and, as seen in Stansted's sectional process drawings, placing them below the terminal. The multiple study models for Stansted’s structural trees, this reconfiguration permitted the development of structural and roof elements as a light-filtering devices. Building upon successive innovations in airport design and the early vision of Foster and Buckminster Fuller's Climotroffice, the process drawings for the New International Airport of Mexico City’s suggest a mission to distil the many distinct structural elements associated with airports into a single, highly functional building skin. The 3D printed study model represents the result: a continuous glass envelope whose triangulated structure allows it to achieve spans three times the length of conventional airports. 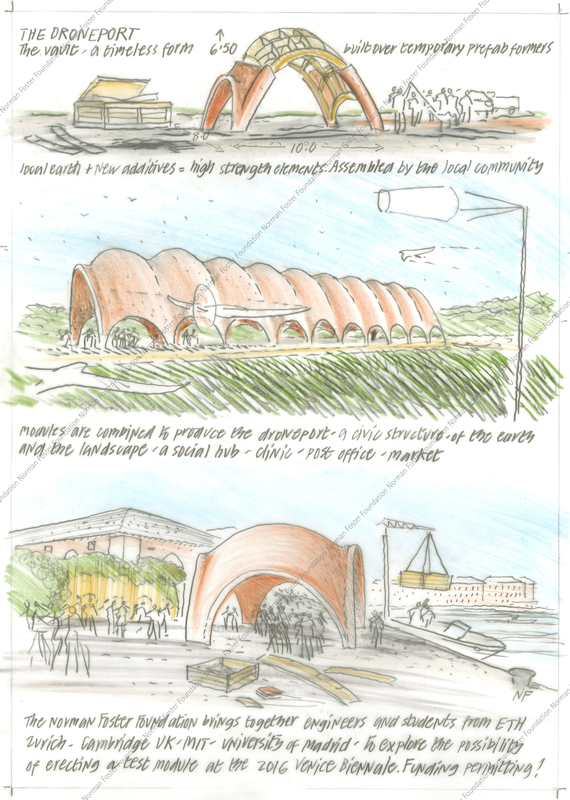 The Droneport developed by the Norman Foster Foundation builds upon these projects in order to connect areas on the African continent without adequate land infrastructure. 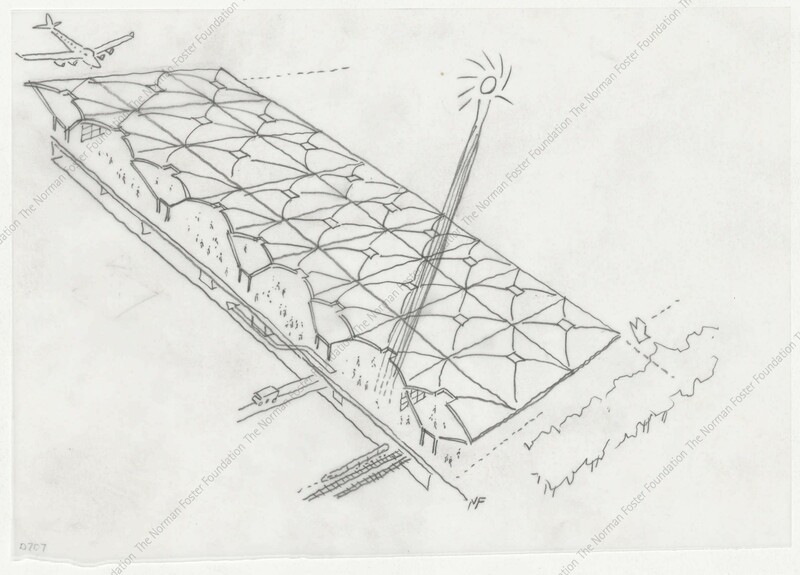 As suggested in the concept drawing, a metal formwork allows for the construction of a vaulted module that can be built by residents using earthen bricks made locally. The project, which maintains a cooperative relationship with the Rwandan government, proposes that flexible configurations of these vaults can not only serve as a hub for drones carrying medical supplies but also as multi-use community centres.